About 300 RV voters claim this motel as home. A recent poll shows the South Dakota U.S. Senate race is a statistical dead heat. Republican John Thune wants to unseat Democrat Tom Daschle. In a race where it looks like every vote will count, Republicans have picked up support from an unexpected group: RV owners. People who live fulltime in recreational vehicles often have problems voting. South Dakota though is RV friendly. Several thousand RV'ers have registered to vote there. Sioux Falls, South Dakota — Trays of absentee ballots fill the tables in a back room at the Minnehaha County courthouse in Sioux Falls. Auditor Sue Roust riffles through the envelopes of an especially interesting precinct. "We have a thousand ballots already in this one precinct," says Roust. "And that's never happened before, that we've had anywhere near that number." The precinct is on the west side of Sioux Falls. Most of the envelopes have the same return address. "Almost all of the ballots as you look at them you'll see they have an address of 4609 West 12th Street. That is the Tower Campground," says Roust. "And that's what a lot of RV'ers put down as their residence address when they register to vote here." It's all completely legal. RV'ers with an address can vote - even if they've never lived in the state. Roust says about 2000 RV'ers are registered in Minnehaha County. She bases that on a computer printout which shows voters claiming the same address. Almost 1000 list the Tower Campground. 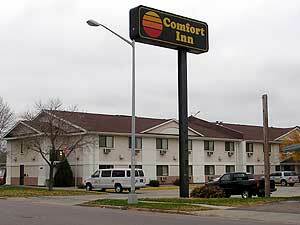 More than 300 claim a Comfort Inn motel as home. Other parts of South Dakota also have clusters. In Hanson County, population 3100, more than 800 RV'ers are registered. Most have never stayed in South Dakota for more than a few weeks. Robert Hillman is one example. "We used to live in Missouri. And I had sold our home and we were traveling and living in the RV totally," says Hillman. "So I had nowhere to establish a residence as far as driver's license and living and voting and paying income tax and so on." Hillman got a South Dakota driver's license and made the state his legal home. It's one of a handful of states where the nation's more than one million RV'ers can easily establish residency. Mark Nemeth works for the Escapees RV Club in Livingston, Texas. That group sued to force local county officials in Texas to accept RV'ers as residents. Nemeth says out of date state voting laws are a big problem. "Their voting statutes are written around the concept of a fixed residence somewhere within a county. And so it makes it a little more difficult sometimes for RV'ers who are traveling, who are upstanding citizens and who certainly have the right to vote, to be able to register to vote," says Nemeth. In South Dakota about 70 percent of the RV'ers registered to vote have requested absentee ballots. That strong turnout is no surprise to Paul Eidsness. He owns Alternative Resources of Sioux Falls. The company helps RV'ers establish South Dakota residency. It also performs services for them, including mail forwarding. Eidsness says RV'ers initially are attracted by South Dakota's low taxes. He says once they become residents many take an interest in politics. "There's a lot them that come in here and they really want to register to vote and they follow what's going on in the state of South Dakota," says Eidsness. Some states have taken action to block RV'ers from voting. Nevada accepts them as residents, but only allows RV'ers to vote in the presidential race. The concern in Nevada is that RV'ers might sway local elections. In South Dakota, Minnehaha County Auditor Sue Roust is also concerned. She's a Democrat. She says RV voters tend to favor Republicans. She uses the Tower Campground precinct as an example. "The voters who I consider to be the resident voters, there's a slight Democratic edge in registration. Whereas with the RV'ers, it's Republicans 46 percent, Democrats 27 percent," says Roust. In most elections a few thousand RV votes would carry little weight or worry. Close races though have become almost the norm for South Dakota. A little over 500 votes separated the senate candidates in 2002. This year looks as close. If it's a cliffhanger, state residents may pay much more attention to the owners of recreational vehicles.